"I'm not really great with living things." 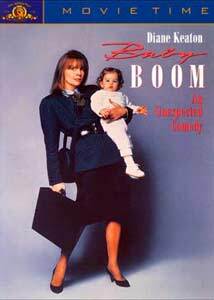 Baby Boom stars Diane Keaton as J.C. Wiatt, a hard-driving businesswoman whose life is thrown into disarray when she "inherits" the orphaned infant daughter of a long-lost cousin. Her live-in lover Steven (Harold Ramis) can't cope with the change, her employer Fritz (Sam Wanamaker) questions her commitment to the firm, and her assistant Ken (James Spader) begins assuming her responsibilities at work. Meanwhile, Wiatt falls in love with little Elizabeth (played by twins Kristina and Michelle Kennedy) and sets out to establish a new life in Vermont, replete with homeowner difficulties, new business opportunities, and one Dr. Jeff Cooper (Sam Shepard), the local veterinarian. At its best, Baby Boom has a few things to say about the values of the "fast track" versus those of hearth, home and family. At its worst, it's sitcom material stretched out into a nearly two-hour movie. There's no shortage of comic talent on hand here—Keaton is ably supported by Ramis, Saturday Night Live cast members Mary Gross and Victoria Jackson, and Annie Golden (of National Lampoon radio and stage show fame) in small roles. But the material only goes so far—the first act has a lot of truly funny moments and a satirical New York sense of humor, but after the locale shifts to Vermont, the story softens and turns its attentions away from the initial setup. It soon becomes a standard, predictably upbeat comedy, complete with a montage sequence as Wiatt's new business takes off, and Bill Conti's sappy, caffeine-free score doesn't help. I don't want to be too hard on Baby Boom—it's not too cloying or sentimental to stomach, and it benefits greatly from Diane Keaton's genuine, charming presence onscreen. But it hasn't dated very well—its criticism of the Yuppie ethic no longer seems fresh nor even all that interesting. It's a cute little movie, executed competently. Nothing more. Image Transfer Review: MGM presents Baby Boom in its original 1.85:1 widescreen theatrical aspect ratio. The nonanamorphic transfer is taken from a relatively clean source print, but the generally soft image suffers from heavy grain hazing and frequent instability on thin edges. Diane Keaton's character wears a polka-dot necktie that shimmers and changes brightness whenever it's onscreen, credits are noisy and flickery, the transfer often seems overly dark, and the visual quality of this single-layer disc is just not up to contemporary standards. Audio Transfer Review: Baby Boom retains its original Dolby 2.0 Surround audio mix, presented in English and dubbed French. Aside from some surround effects during the opening MGM/UA logo, a quick stereo pan at the beginning of the film, and some full-bodied music during the end credits, the 2.0 track is largely monophonic in character. The French dub is reasonably well-synchronized and generally similar to the English presentation. Both analog tracks are simple but functional, cleanly transferred with no distracting flaws, but frequency and dynamic range are limited and the "stereo surround" billing almost seems an exaggeration. Extras Review: Very little to report here—sixteen picture-menu chapter stops, French and Spanish subtitles, and the original theatrical trailer in 1.85:1 nonamorphic letterboxed format. The trailer shares the image shortcomings of the feature presentation, and the subtitles tend to overlap the "black bars," a guaranteed annoyance when viewed on 16:9 (or matted 4:3) displays. Baby Boom is a pleasant but insubstantial comedy about life choices, ambition and genuine happiness. MGM's DVD transfer is below average, with no supplements of any substance. A rental at best.